Click here to download our firm brochure in PDF format. We are proud to have been selected as the Portland, Oregon member of the Network of Leading Law Firms, an organization of law firms throughout the United States and around the world. 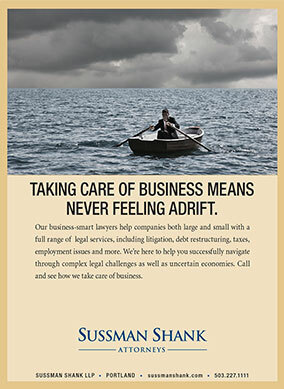 A Business Law Firm for Modern Times. 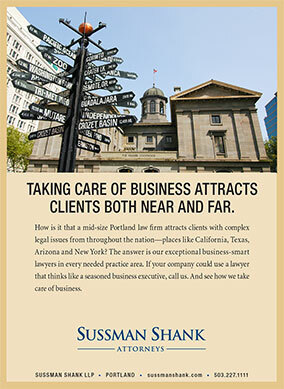 What does taking care of business mean to Sussman Shank? It means helping you achieve your goals. It means understanding your specific needs, your business and your industry. It means applying our extensive experience, knowledge, and skills in a broad range of practice areas and industries to help you succeed. 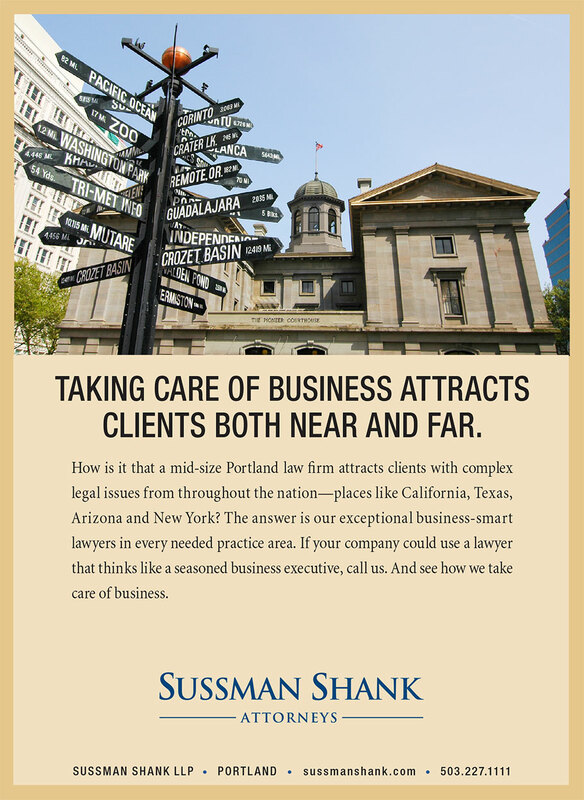 Sussman Shank is a mid-size law firm in Portland, Oregon with attorneys admitted to practice in Oregon, Washington, California and several other states. We are an experienced team of over 30 attorneys who have the insight and ability to help clients succeed in today's challenging business environment. Our clients include public and private companies, government entities, institutions, non-profit organizations, and individuals. While we are based in the Pacific Northwest, we frequently represent clients in court proceedings and business transactions throughout the U.S. We also have access to legal expertise in other countries through our affiliation with the Mackrell International Network. 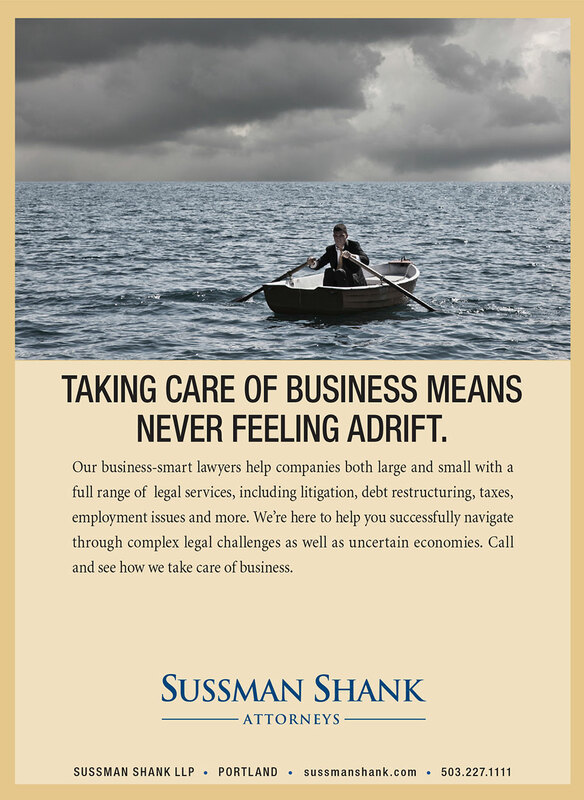 Sussman Shank LLP is a proud member of Mackrell International, one of the world's premier networks of independent legal firms. Our membership in Mackrell enables us to provide our clients with efficient access to high quality law firms located throughout the world. With 87 firms in 152 offices and 57 countries, Mackrell provides access to more than 4,500 lawyers worldwide. Additional information about Mackrell International may be found on their website at mackrell.net. We recently launched a new subscription fee service. For a flat fee, paid yearly or in monthly installments, we provide clients with a limited set of business, trademark, employment, and data privacy services. 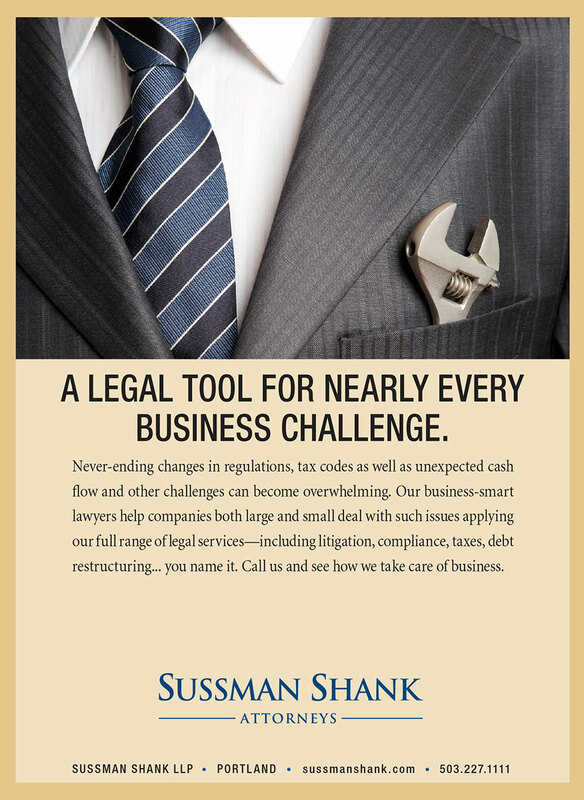 Founding Partner Gilbert Sussman's "Simple Truths"
Gilbert Sussman was the founder and senior partner of Sussman Shank LLP until his death in 1985. 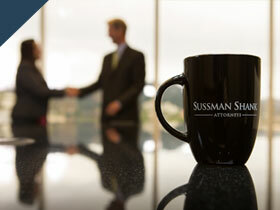 Mr. Sussman attended the University of Oregon and Columbia University School of Law. From 1929 to 1934 he was a member of the staff at Yale Law School. He went on to become Senior Attorney for the Agricultural Adjustment Administration and NRA in Washington, D.C. After his return to Portland in 1935, Mr. Sussman was Regional Attorney for the U.S. Department of Agriculture and Assistant General Counsel, Bonneville Power Administration. In 1946 he entered private practice in Portland. 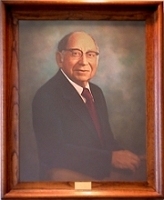 In 1960 he founded our firm. Gil was recognized as a dean of the Oregon bankruptcy bar. During his career, he was involved with many of the largest bankruptcy and reorganization cases in the state. Gil was a leader and innovator in both national and local legal organizations. It was a testimonial to his standing with the bar and in his own community that his point of view was so readily accepted on several issues of the times. Gil was also an officer and member of the Portland City Club and a director of the Portland Chapter of United Good Neighbors. He was also active in many other civic and religious organizations, yet still found time to indulge his enthusiasm for gardening. 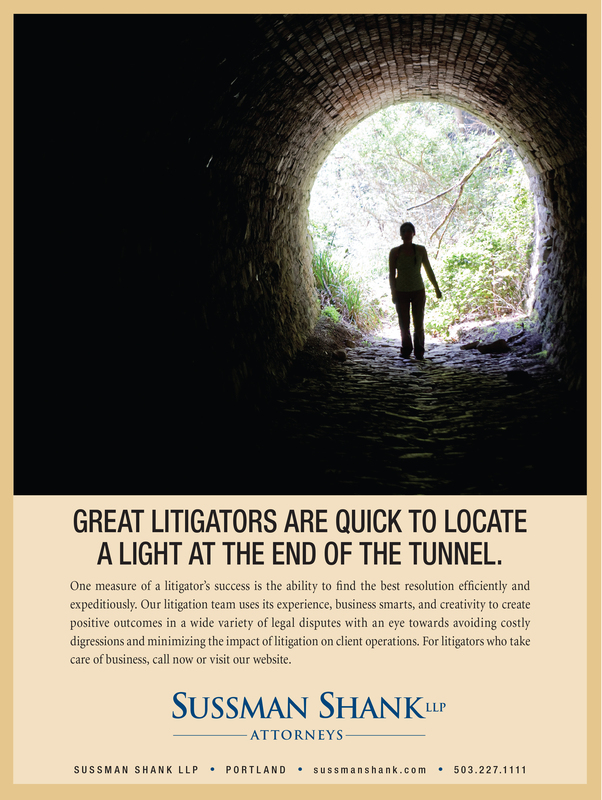 When Gilbert Sussman founded the firm in 1960, he brought with him a philosophy of conduct that earned him great respect among clients and colleagues alike. Today, Simple Truths form the foundation of honorable legal work and serve as the credo by which the firm continues to practice. A baker has his bread, a furniture maker has his chair, but a lawyer's product is the elusive and intangible word. Gil understood that the value of a lawyer's words was directly related to his or her reputation in the community and the esteem in which the listener held the speaker. Esteem is earned over time, but can be lost suddenly and permanently if the speaker is caught in a lie. Gil taught us that no client or case is worth the cost of losing our reputation. He did not manipulate the concept of truth. Not only did Gil always give us the truth, he gave us the whole truth. When asked about his willingness to exploit another lawyer's misunderstanding, Gil would patiently inform the questioner that trust and respect are not fostered by the mere avoidance of dishonesty. Gil wanted his listener's trust and respect and knew that momentary gains resulting from exploitation of another lawyer's failures would at best provide only a short-term benefit to his present client. He knew that keeping the trust and respect of his foes would ultimately be more advantageous to his present client and all future clients. Human beings are vulnerable and have emotions. Gil read his adversaries, as would any excellent attorney. He sensed their weaknesses and evaluated their strengths. But Gil never attacked another lawyer personally to gain an advantage for himself or his client. Gil liked being a lawyer. He believed that the practice of law was a dignified profession. He believed that to destroy the dignity of a lawyer would be to destroy the dignity of the profession. He treated even the most junior lawyers with courtesy and respect. Gil rose above his adversaries' weaknesses. He fought hard, but he fought fair. When he won, he seldom rejoiced in public, and he never reminded an adversary of his defeat. Experience had taught Gil that he was most effective in advocating his client's position (either in court or through his usual course of negotiating an advantageous settlement) if his adversaries knew that even if Gil "whipped the pants off them" he would always leave them clothed in their own dignity. Gil believed that every dispute was capable of a negotiated settlement. Gil's settlement technique was simple. He evaluated a matter thoroughly to determine a settlement advantageous to both sides and then proposed the settlement to his adversary. Gil's settlement technique demanded that he develop empathy for his adversary's position. By understanding his adversary's needs and goals, Gil could effectively maximize his client's position while also allowing his adversary to satisfy some of his needs and realize a number of his goals. He would often say to his adversary that "a settlement that is good for my client is not necessarily bad for yours." Although Gil was not formally trained in psychology, he had an instinct sharpened through experience that allowed him to evaluate his adversary better than any psychologist employing Maslow's hierarchy of needs. To Gil, a good settlement was not one where everyone was equally dissatisfied with the result. Instead, a good settlement was one in which everyone believed that they had won. Gil always tried to find solutions that made good business sense. When a particularly self-righteous adversary insisted on taking undue advantage, Gil might be heard to remark, "Look, does your client want blood or money? If he wants money, we can help him." He had a knack for making people focus on workable plans, rather than on winning or losing. Dark alleyways were not Gil's hangouts. Lighted stadiums were more characteristic of his style. Gil had supreme confidence in himself and his arguments. He did not need to take advantage of his adversary's lack of attention. Gil liked the challenge of a fair fight. Fairness demands knowledge, fair warning, and an opportunity to protect oneself. Gil always gave his adversary such knowledge, warning, and opportunity. Gil believed that justice was dependent on a complete examination of all facts. If one party was not given an adequate opportunity to explore the facts, justice might not be done. He believed that when injustice occurs, appeals result, costs and expenses multiply, trust is destroyed, communications cease, battle lines are drawn, and the negotiated solution is lost forever. Gil was in it for the long haul. Clients sought him out because of his reputation, the product of many years of consideration, honesty, and integrity. He was an effective advocate who earned our respect and admiration. All of Gil's Simple Truths boil down to the ultimate simple truth: "Do unto others as you would have them do unto you." This article was first published in 1986, shortly after Gilbert Sussman died. At that time, co-author Howard M. Levine was an associate with Sussman Shank LLP and worked closely with Gilbert Sussman. Kevin D. Padrick was with the Portland law firm of Miller Nash LLP and frequently represented positions adverse to Mr. Sussman's. Copyright © 1986 by Howard M. Levine and Kevin D. Padrick. All rights reserved. Please click the images below to view Sussman Shank LLP's print advertising campaign. 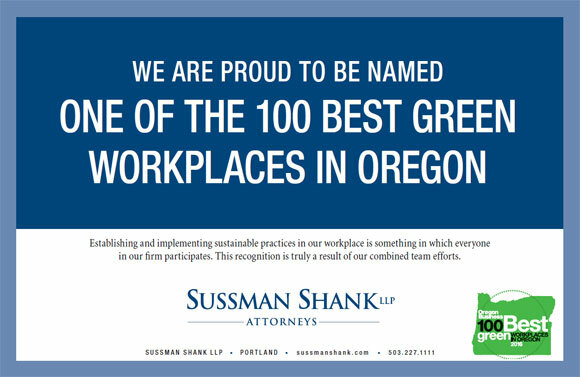 Sussman Shank is dedicated to a philosophy and environment that embraces cultural differences, promotes equity and equality, and engenders mutual respect; thereby creating an environment where everyone has the opportunity to excel, pursue their goals and aspirations, and is reflective of our clients' diversity and the state of Oregon. Our commitment goes beyond internal initiatives; we support inclusion, equity and diversity in the legal profession and in the community in general. 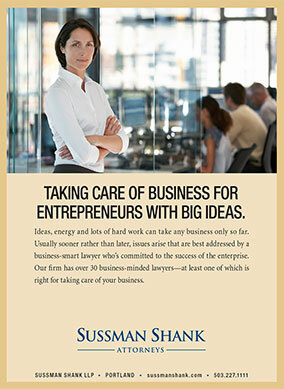 Sussman Shank strives to develop a culture that authentically brings the perspectives and contributions of all people to the table, equitably distributes power, and incorporates their needs, assets and perspectives into the design and implementation of processes, policies, activities, and decision-making.